The more people realize that our liturgy and hymns come directly from Holy Scripture, the more we will appreciate the depth and richness of our worship! The trouble is that folks often speak of Lutheran liturgy and the historic worship of the western Church as if someone somewhere made it all up. Many have begun to print Scripture citations in their bulletins and worship folders so that worshipers will realize the dialogue and responses are biblical—so that liturgy is truly a three-way conversation between God, His people and the pastors called to shepherd the flock. I can’t imagine anything emptier and more meaningless than a worship service I created out of nothingness—with no Scripture, just my own thoughts and intentions. Our reading for today from Isaiah presents us with the prophet’s vision of the Lord God on His throne, with winged creatures around Him, singing praise and glory. These words are cited as we greet the risen Jesus, incarnate in the Bread and Wine of the Lord’s Supper, as we sing the “Sanctus,” which translates, “Holy.” In Holy Communion, the Lord God comes to us in Jesus, broken and poured out for us. It also is quoted in the beloved hymn, “Holy, Holy, Holy.” We are singing and praying Scripture, as we worship each week. A meaningful adult class or gathering in your congregation might be to find the Scripture citations used in our Lutheran worship, considering their context in the Bible and how they function in the Sunday service. Who is speaking? Where are they found? Why are they used in worship? 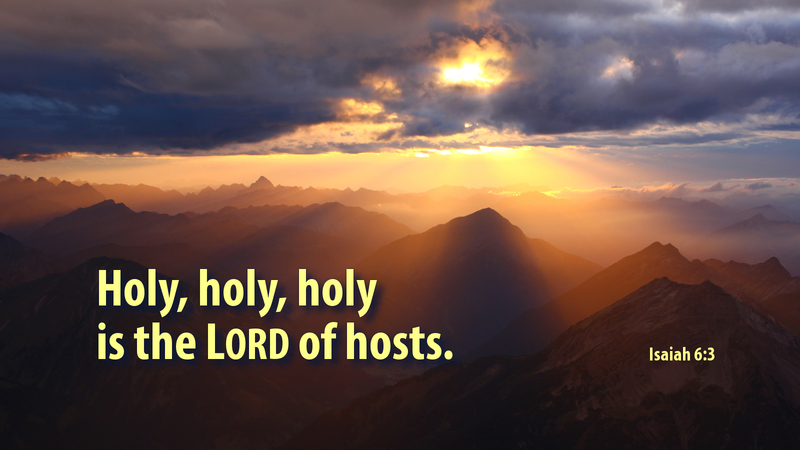 Prayer: Lord God, give us mouths to sing continually, holy, holy, holy is the Lord of Hosts! Amen. Advent Action: Email me and I will send you the booklet I wrote for my congregation in Colorado Springs, highlighting the Scriptural basis for the Lutheran liturgy and explaining why we do what we do. This is a great idea. Maybe the NALC can create a Bible study series or devotional series on this topic!